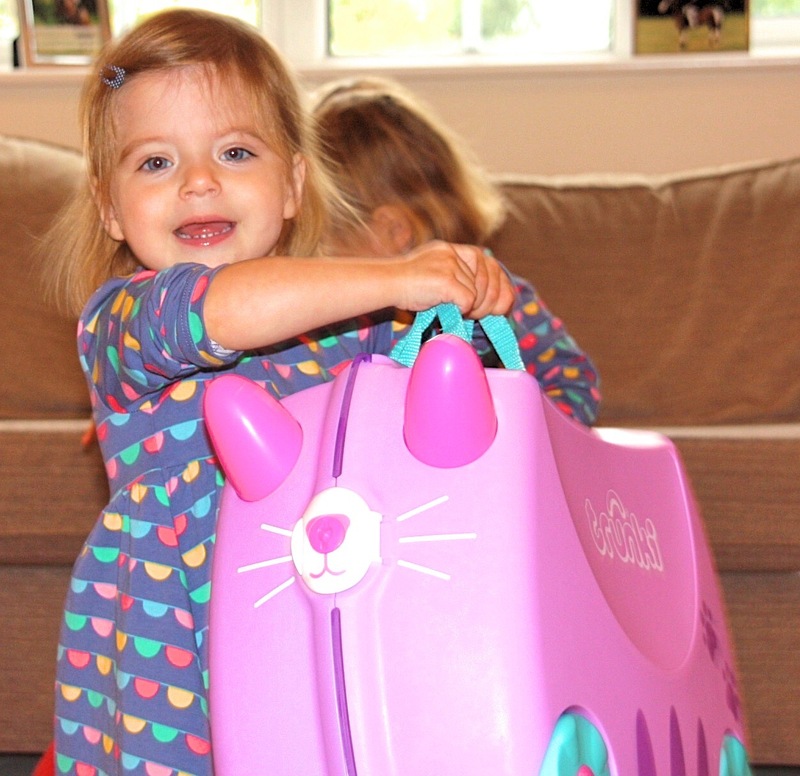 Trunki - Just like Marmite, you either love them or hate them! Blog Trunki – You either love them or hate them! 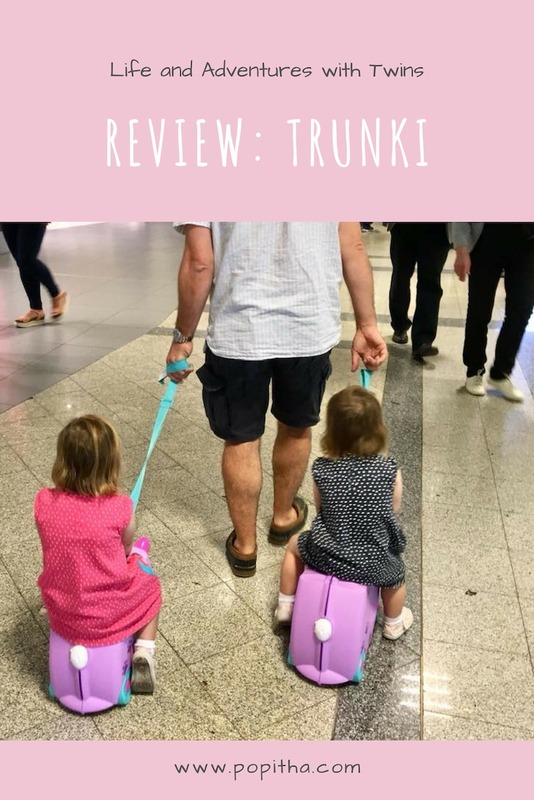 Trunki – You either love them or hate them! If you have children, twins, triplets or quads, gone are the days for travelling light. I know from travelling in the UK and abroad with the twins, we always take a whole heap of stuff. We probably take far too much but somehow it is all needed. I am fairly organised in that I have bags for everything. 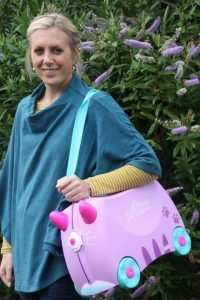 Bags for clothes, bags for toys, bag for snacks etc, but the girls haven’t really got anything that they can call their own or that is child friendly; Well they didn’t, but they do now – Trunkis! In the short time we have owned them, they have been fantastic and had a variety of uses. They saved us during a recent filming job, were great to take on a weekend away, perfect for days with Family to put toys and colouring in, and fun to whizz around the house on with your friends. But what is a Trunki I hear some of you ask? Well…….. read on my friends! A Trunki is a ride on case for children, and a life saviour for parents! 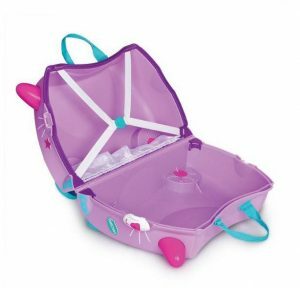 It is a small case with wheels that children can both pull along and carry, or for those who get tired quickly, an adult can pull them along. This month was the launch of two new Trunki friends – CASSIE CAT and ROCCO RACE CAR. Cassie is a cat is lilac in colour, with a turquoise collar, purple paw prints and pink & turquoise wheels. Cassie the Cat Trunki comes with its very own cat collar and glittery stickers ready for kitty adventures! 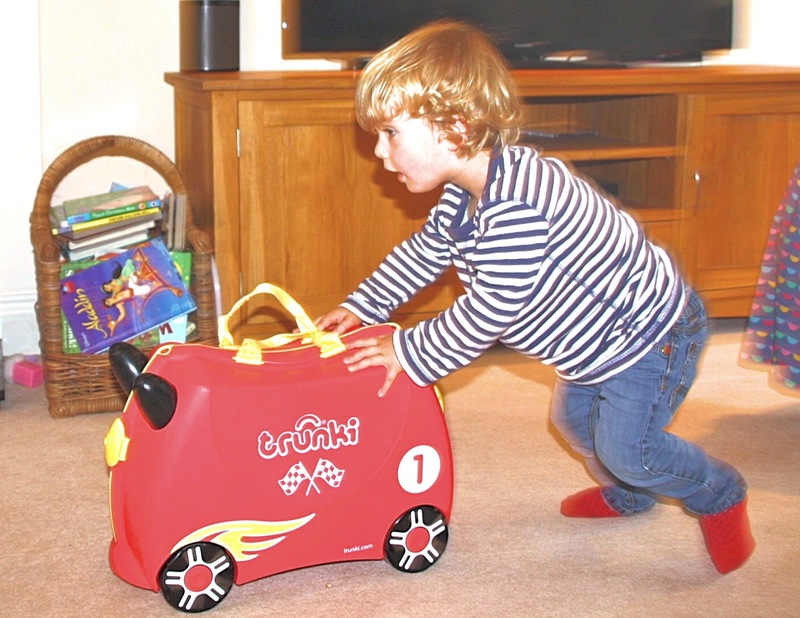 Rocco The Race Car is vibrant red in colour with go faster fiery hub trims, and super cool alloy wheels this new racing car Trunki will be certain to have little petrol heads excited to ride around the track. Rocco the Racing Car Trunki comes with its very own glittery racing car stickers ready for racing through the chequered flag! As with all Trunki ride on suitcases both of these Trunki’s has an 18-litre capacity, a comfy saddle, secure lockable catches, a soft rubber trim, and an internal pocket and teddy bear seat belt. We have been lucky enough to have been given these to review and we have asked some of Popitha’s friends to help too. Both Cassie and Rocco can’t wait to start their adventures with the Popitha Twins. 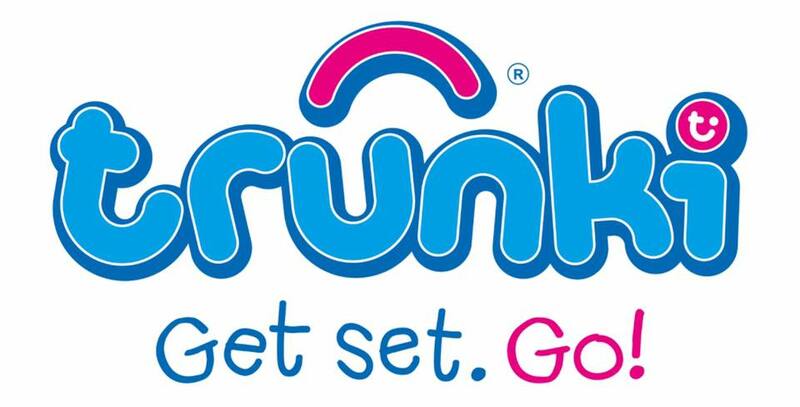 To be in with a chance of winning a Trunki, look at for our giveaway below! Whether you travel in your home country or abroad, Trunki can be a great addition to family holidays. The size of the Trunki is perfect for a long weekend away. It will fit just enough clothes in for your little ones and keeps them all together, or use it to store their holiday toys in. I even pack toys in it when going out to visit friends for the day to keep them amused. When going further afield, Trunki is airline approved and perfect to keep little people amused on the airplane. It has elasticated straps so that you can keep everything in place and organised. Trunki is 46 x 21 x 31 cm and is usually allowed as carry-on luggage. 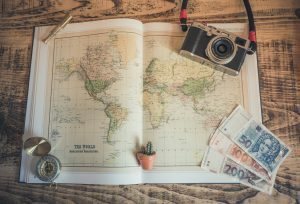 I haven’t heard of it being refused, but because rules and regulations vary from airline to airline, it is always worth checking first. Also remember to check hand luggage weight restrictions, little ones have a habit of saying ‘just one more mummy!’. Trunki also fits under the seat in front of you (just about!). Our Trunki’s were perfect when the girls filmed a TV commercial recently. We filled Cassie Cat full of Toys, and Rocco Racecar with their clothes and off we went! The crew commented how organised we were and how practical the Trunki was. The girls were even able to pull their own Trunki to the green room which helps me masses! 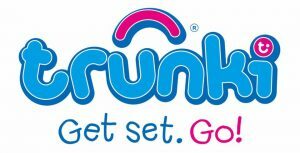 Is Trunki Easy To Pull About And Ride On? So far, we have only used this for days out and weekends away so haven’t used the ride on feature to the best of our ability yet – once we have, I will give you an update. 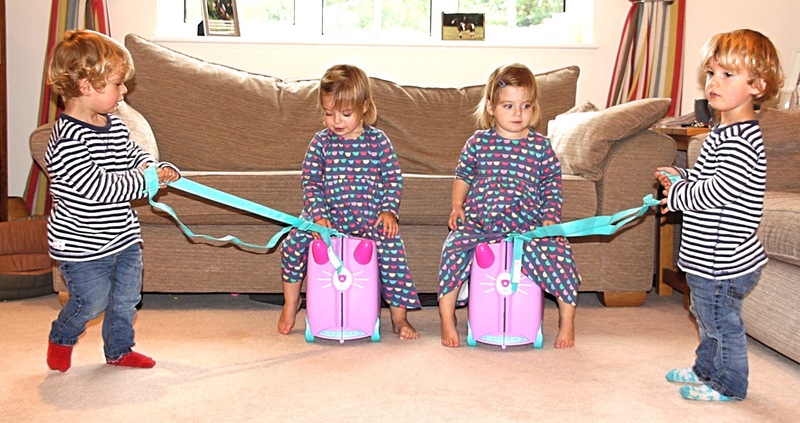 But at home the girls can pull Trunki about happily on their own, and enjoy us pulling them around for fun. Turning corners is a little tricky but I don’t think this will be such an issue in an airport! Pulling Trunki is very easy and light. However, if full, it is not really suitable for little ones to carry as despite a light shell, can be heavy. The length of the lead/strap can be adjusted to suit most ages. It is one strap and changes from a lead into a shoulder strap. Rest tired legs in queues! Hold onto your horns to go faster! Extra durable meaning that any returns we receive can be recycled. Made of plastic so you can easily clean it in the case of spillages. Cassie and Rocco retail at £39.99 each and you can order yours today by clicking here. Thank you also to Frugi for supplying the girls fabulous multi-coloured ‘Tess Twirly Dress’ – It’s our favourite! And thank you to Lily and Me for supplying my gorgeous outfit; the Forest Trail Tunic and the Avebury Poncho. Click the links to see these and more! 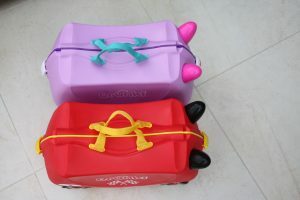 ** The Trunki’s have been given to us in order to write the review but all comments and opinions are Popitha’s.